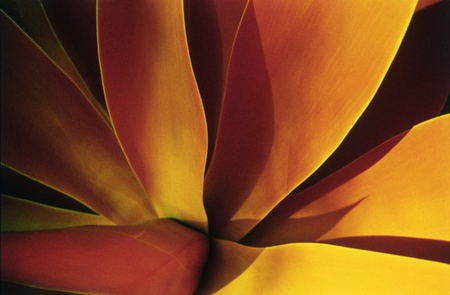 "Homage to O'Keeffe" is a close-up photograph of a large green agave succulent in Balboa Park in San Diego. It was photographed with color infrared film along with a red filter. This films is sensitive to the infrared part of the spectrum which is not visible to the human eye. Green plants reflect a lot of infrared light and, combined with the red filter, their color translates into gold and orange-red tones. The feel in this abstraction goes much more towards floral than plant and to me is reminiscent of the paintings of Georgia O'Keeffe.